Tick is the common name of a class of small arachnids. Ticks are external parasites living on the blood of mammals, birds, and occasionally reptiles and amphibians. 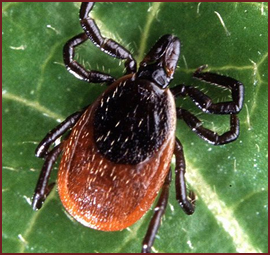 Ticks can carry a number of diseases, including Lyme disease, Q fever, and canine jaundice. Ticks are blood-feeding parasites that are often found in tall grass and shrubs where they will wait to attach to a passing host. 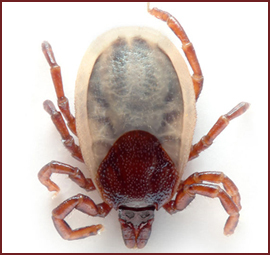 A tick will attach itself to its host by inserting its cutting mandibles and feeding tube into the skin.